Grab this last opportunity of the year to connect with hiring employers before the fair! Join us and learn networking basics with more than 20 of the employers who'll be attending the career fair the next day. Career Center counselors will cover the essentials during a short guided workshop, leaving plenty of time for open networking over hors d oeuvres and sparking water. 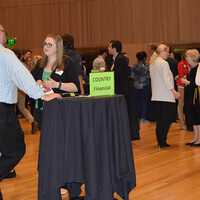 This is a classic student/employer networking event, a more intimate opportunity for participants to connect prior to the next day’s Career Fair. After introductions, we conduct a short, guided networking workshop involving everyone in the room. This can include three or four short exercises in networking presented either by a recruiter or Career Center staff member. Afterwards the floor is open to free-style networking allowing students to talk with any and all employers of interest.